Review by AllTheBestFights.com: 2016-04-30, tough exchanges and great finish: Fernando Montiel vs Jorge Lara is close to get four stars! The former world champion in three different weight classes Fernando Montiel entered this fight with a record of 54-5-2 (39 knockouts) and he is ranked as the No.23 featherweight in the world but he comes off the loss against Lee Selby (=Selby vs Montiel). His opponent, the undefeated Jorge Lara, has an official boxing record of 27-0-2 (19 knockouts) and he entered as the No.62 in the same weight class. He fought twice last year beating Mario Macias Orozco but then he drew with Jesus M Rojas. ‘Cochulito’ Montiel vs Lara is on the undercard of Victor Ortiz vs Andre Berto 2. Watch the video and rate this fight! Review by AllTheBestFights.com: 2015-10-14, some good exchanges in the second part of the fight but it is not enough to get three stars: Lee Selby vs Fernando Montiel gets two. Lee Selby entered this fight with a boxing record of 21-1-0 (8 knockouts) and he is ranked as the No.6 featherweight in the world (currently the #1 in this division is Nicholas Walters). His only loss occurred in 2009 when he faced Samir Mouneimne, since then he has collected 17 consecutive victories winning the Ibf world belt in his last bout, against Evgeny Gradovich (=Gradovich vs Selby). His opponent, the former world champion in three different weight classes Fernando Montiel, has an official record of 54-4-2 (39 knockouts) and he entered as the No.15 in the same weight class. He suffered his last defeat in 2011, against Victor Terrazas, and then he has won eight bouts beating Rogelio Jun Doliguez in his last one (=Montiel vs Doliguez). 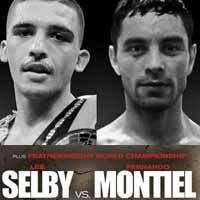 Selby vs Montiel is valid for the IBF World featherweight title; undercard of Devon Alexander vs Aaron Martinez. Watch the video and rate this fight! Review by AllTheBestFights.com: 2015-03-14, good start but the rest of the fight was not so exciting: Fernando Montiel vs Rogelio Jun Doliguez gets two stars. The former world champion in three different weight classes Fernando Montiel entered this fight with a professional boxing record of 53-4-2 (39 knockouts) and he is ranked as the No.18 super featherweight in the world; he suffered his last defeat in 2011 when he faced Victor Terrazas, since then he has won seven consecutive bouts, the last one against Sergio Puente (=Montiel vs Puente). His opponent, the 23-year-old Rogelio Jun Doliguez (13 years younger than Montiel), has an official record of 19-2-2 (14 knockouts) and he entered as the No.53 featherweight but he lost two out of his last three fights: against Gabriel Francisco Pina (then Doliguez won the rematch) and Dennis Tubieron. ‘Cochulito’ Montiel vs Doliguez is the main event of the evening. Watch the video and rate this fight! Review: 2014-07-26, Fernando Montiel vs Jesus Rios gets three stars only thanks to a good finish. Fernando Montiel entered this fight with a pro boxing record of 51-4-2 (38 knockouts) and he is ranked as the No.20 super featherweight in the world, he has won world titles in three different weight classes, but the last world title fight was in 2011 when he lost to Nonito Donaire (The Ring magazine “Knockout of the Year 2011”: Donaire vs Montiel), since then he has collected seven victories and one loss, against Victor Terrazas in 2011. His opponent, Jesus Rios, has an official record of 30-5-1 (24 KOs=80%), he suffered his last loss in 2013 when he faced Michael Farenas but he came back to victory in 2014 winning three consecutive fights. ‘Cochulito’ Montiel vs Rios is the main event of the evening. Watch the video and rate this fight! Review: 2014-03-15, pretty good fight with two knockdowns: Fernando Montiel vs Cristobal Cruz gets three stars. Fernando Montiel entered this fight with a professional boxing record of 50-4-2 (38 KOs=76%) and he is ranked as the No.8 super bantamweight in the world, he has won world titles in three different weight classes but not in the one he has been fighting; he suffered his last defeat in 2011 when he faced Victor Terrazas, since then he has collected four consecutive wins. His opponent, Cristobal Cruz, has an official record of 40-15-3 (24 knockouts) and he entered as the No.78 super featherweight, he lost three out of his last four fights. ‘Cochulito’ Montiel vs ‘Lacandon’ Cruz is the main event of the evening. Watch the video and rate this fight! Review: 2013-06-22, entertaining fight with two knockdowns: Fernando Montiel vs Jaderes Padua gets three stars. Fernando Montiel ranked as the No.13 super bantmaweight in the world, entered the fight with a record of 49-4-2 (37 knockouts) while Jaderes Padua had a record of 8-2-1 (5 knockouts). Montiel vs Padua is the main event of the evening. Watch the video! Review: 2012-11-24, pretty good fight with a very exciting last round: Fernando Montiel vs Giovanni Caro gets three stars. Fernando Montiel (48-4-2) entered as the No.14 super bantamweight in the world while Giovanni Caro (24-11-4) entered as the No.27. Montiel vs Caro is valid for the vacant WBC USNBC Silver super bantamweight title. Watch the video! Review: 2012-03-03, pretty fight with a good knockout in the ninth round: Fernando Montiel vs Angky Angkota gets three stars. Fernando Montiel, ranked as the No.11 super bantamweight in the world, entered the fight with a record of 46-4-2 while Angky Angkota had a record of 25-6-0. Watch the video! Review: 2011-08-20, important victory for Fernando “Cochulito” Montiel but the fight was not very spectacular: two stars. Fernando Montiel defeated Alvaro Perez by KO in the third round; this match was the second fight for Montiel in the super bantamweight division after the defeat against Nonito Donaire (one of the best ko of 2011). Watch the video!